Travel with Martin Stadius as he searches for answers to a story that begins on the shores of Oregon's beautiful Wallowa Lake and ends in the wind-swept, barren hills at Bears Paw, Montana. 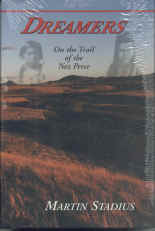 Stadius tells the story of the Nez Perce people-the Nee-Me-Poo. In 1877 the "Dreamer" (non-Christian) faction of the tribe, under pressure from land-hungry whites to move to a reservation, fled their homeland in eastern Oregon and central Idaho. During the next three months, Nee-Me-Poo warriors, seldom numbering more than 100, handed the United States Army some of the worst defeats in its history. 6x9, hardcover, 450 pages, maps, photos, index, bibliography.